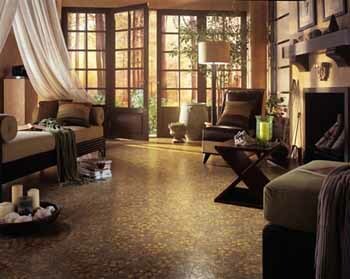 Armstrong is one of the most recognized brand names in vinyl flooring. For years, Armstrong has filled consumer's homes with quality vinyl. 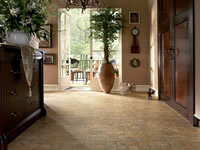 Leading the way in vinyl flooring innovations, Armstrong strives to deliver both beauty and functionality. When you see an Armstrong floor, you can be assured that it will contain quality visuals of stone, ceramic, wood, sisal, and linen with durability and easy maintenance. 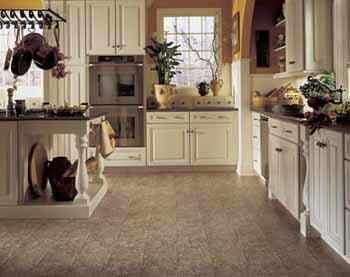 Armstrong vinyl is offered at wholesale vinyl prices to allow you an affordable solution for having the floor of your dreams. 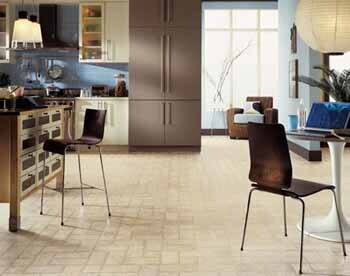 Why Choose Armstrong Vinyl Flooring? 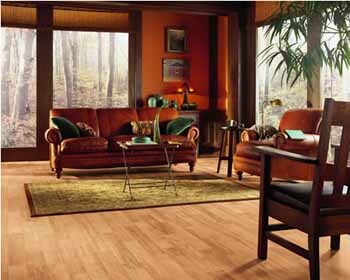 Vinyl sheet is a layered construction sold in 6' and 12' widths. Felt represents over 90% of vinyl sheet floors sold today. Fiberglass is a newer construction format. 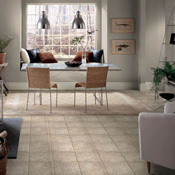 Fiberglass is the "cushiest" form of vinyl flooring and offers the most installation options. A) Protective top coat: Urethane or other high-performance top coats which make the product easy to clean and resist scratches and scuffs. B) Protective clear vinyl layer: Adds durability and helps protect against rips, tears and gouges. The thicker this layer, the better the performance. The flooring's appearance retention and general durability is largely dependent on the quality and thickness of the clear wear layer. C) Printed vinyl design layer: The rotogravure printing process offers an unlimited range of patterns and designs, including very realistic interpretations of natural materials. D) Felt: Felt bottom layer that adheres to the subfloor. D) Fiberglass: A fiberglass structural layer makes the product more dimensionally stable (will not curl, allows it to lay flat, and install without glue). 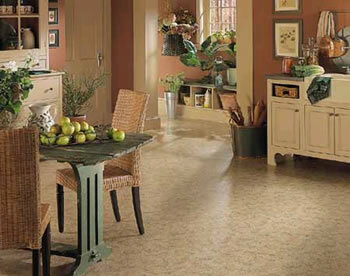 A cushiony vinyl backing provides added underfoot comfort. The biggest installation challenge is cutting the vinyl sheet to size. Vinyl is bulky, heavy and awkward to work with. If this is a DIY project, look for kits that will help you create a pattern and cut the vinyl properly. 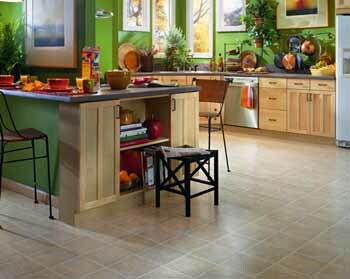 Subfloors must be smooth, flat and dry prior to the floor's installation. 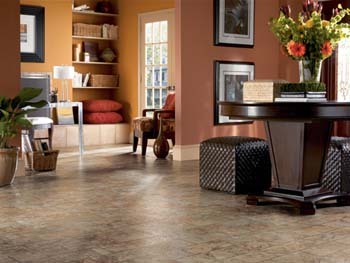 Vinyl can install over concrete, hardwood, plywood, or an existing resilient floor, as long as the subfloor surface is prepped. You may need to use an embossing leveler to smooth textured surfaces, fill in grooves or patch irregularities. Installation methods vary with floor construction. Felt: These floors install with full spread (adhesive spread under the entire floor), or, perimeter adhesive (adhesive around the outside edges) methods. 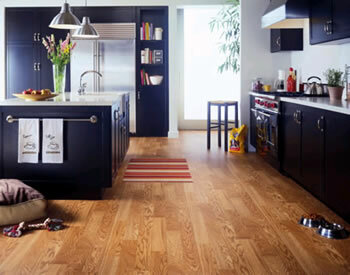 Fiberglass: These floors can be adhered via loose lay (no adhesive), modified loose lay (adhered to the subfloor in a few strategic spots such as under heavy appliances with double-sided tape or adhesive), or, they can be adhered via full spread (adhesive spread under the entire floor) methods. Full-spread or perimeter installation (felt or fiberglass ) is more durable than loose lay or modified loose lay (fiberglass). However, this method is more permanent and is difficult to remove if you decide to remove the floor at some point in time. 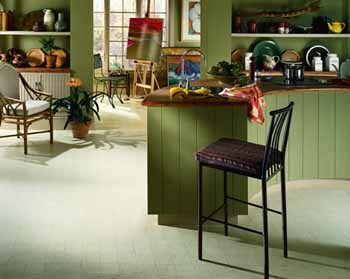 Fiberglass floors are more flexible and can be more "forgiving" to minor subfloor imperfections than felt construction. 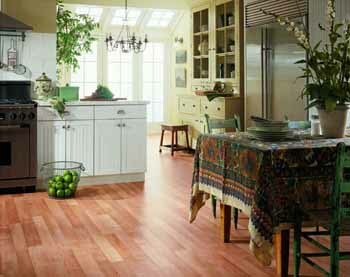 Fiberglass loose laid floors can buckle with temperature and humidity fluctuations if not installed correctly. Leave a 3/16" to 1/4" space around the perimeter to allow for subfloor movement. Always use the brand of adhesive recommended by the manufacturer. Otherwise, you may nullify the warranty. 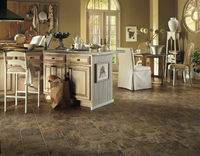 An experienced DIYer can successfully seal a vinyl floor seam. If in doubt, this is best left to a professional.